Topic: Front Page Story: Clemson's message to Mike Davis: "We need you"
Front Page Story: Clemson's message to Mike Davis: "We need you"
Clemson's message to Mike Davis: "We need you"
The kid is absolutely amazing. He reminds me so much of Reggie Merriweather, but Mike has more talent. He is going to be great. Hope he ends up in Tiger orange. We would be lucky to get Mike Davis to come to Clemson. So I know teams have to go after players but this makes me wonder about AE and MB future. Hope both come back and we get Davis. As we all know we need depth everwhere. Well he seems like his brother a bit in the sense that he's a more physical back than AE or Bellamy. As I've said in other threads, this is a time when there's really no such thing as a 1-back system. We need speedy guys like Bellamy and AE (though he can do both) to fly outside, and bigger guys like Davis or Marshall (though obviously he's not part of our future) who are quick, but also physical to pound it up the gut. You can survive with one, but you thrive with both. YOU COULD COME TO CLEMSON AND DO SOMETHING BIG BRO NEVER DID AND WIN A ACC CHAMPIONSHIP AND LEAVE YOUR OWN LEGACY. PLUS YOU ALSO HAVE SOMETHING BIG BRO DIDNT HAVE. CHAD MORRIS AS OFFENSE COORDINATOR WHICH HAS SHOWN EQUALS SUCCESS AND CHAMPIONSHIPS. One good thing if Iam not mistaken Brooks will becomeing in as a early enrollment which is good I see him being a player for us and hes smart +1. We're going to have a hard time landing him. Hate to say it but it's true. I'm not sure Clemson has a journalism major in any form, but even if we do it's pretty small. Interesting but why would he commit to a school that doesnt have the major he wants? Dont have a journalism major, i doubt he wants to be known as James Davis' brother, and he didnt sound too hyped up over the visit or offer. I agree we need to spend our time with Gurley. Clemson has a broadcasting major. Unfortunately it's broadcasting fertilizer and not the news. I was thinking the same thing.......coots have a journalism school.....ironic huh? "The Davis Family are #Tigers4Life RT @Only1JamesDavis: Mom is enjoying the Clemson offer to my little brother." Well Dabo's got Momma, now get Mike. agree! IMHO he has had his feeling hurt by this delay in the offer;; look for him to be a coot! 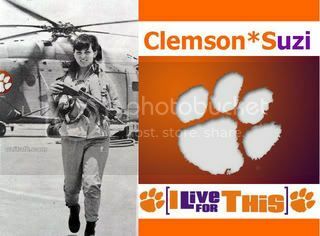 come to Clemson. Was an early Fla commit. We'd have been wasting time to pursue him any sooner. It's my feeling that he let our coaches know it wasn't gonna happen. He's open to us now only because things went bad with the gators. tells you that you "need" the extra _________ with your car. Re: Front Page Story: Clemson's message to Mike Davis: "We need you"
I'd rather have Mike Davis than current Bellamy. i was really wondering what a coach could do to lie to a kid he recruited. Then i read that Weis is going to Kansas......ahhhhhh. It seems Weis really has a lack of character. I think Weiss going to Kansas has more to do with internal issues between he and Corch Boom. Say what you want about Weiss' character, I'm pretty sure they just didn't get along at all. Kansas is not an attractive head coaching job, so there would have to be something pushing him in that direction. He's going to need somebody 'pushing him' because he can barely move now.